Please provide Newborn Hope (November Noel) with more information about your interest in participating in Zoya’s Legacy of Hope to help us continue to provide resources for Colorado babies and families impacted by prematurity. To read more about Zoya’s Legacy of Hope fund and to print the brochure, please click here. I have already named Newborn Hope in my estate plan. I am interested in joining Zoya’s Legacy of Hope. I would like more information about planned giving. 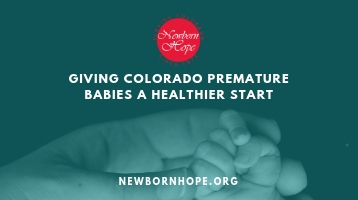 Giving Colorado Premature Babies a Healthier Start.